The Haredim didn’t have much use for Israel, either. First imagined by the non-religious Jewish visionary Theodor Herzl as a secular, democratic society where rabbis had “no privileged voice in the state” (in what would become known as Zionism), Israel was viewed by many Haredi Jews as an abomination. The only true state of Israel, they believed, would be established by the coming of the Messiah. When the armistice that established the state’s borders in 1949 failed to include either the biblical land of Judea and Samaria (home to Jewish patriarchs and matriarchs) or the Old City of Jerusalem (that houses the Western Wall, Judaism’s most significant religious site)—many Haredi rabbis wept. 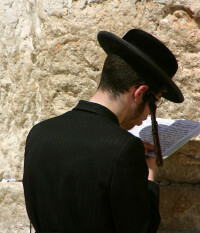 While many Western movies like to depict Israeli Jews as wearing long beards and broad-brimmed caps (or as tough-guy Mossad agents), Haredi Jews make up a minority of Israel’s population. Most other Israeli Jews observe their faith while engaging society—studying the Torah while also working full-time or sending their children to serve in the army after studying at religious schools. But there is no precedent in Jewish history or holy texts for entire families to get paid to study the Torah while living apart from society. Far from dying out, as Ben-Gurion believed, the population is growing. With birthrates three times higher than the Israeli average, Haredi Jews have doubled their population since 1990. By 2028, Haredi Jews are expected to account for 1 in 3 Jewish children under the age of 14. If trends continue, they will combine with Israeli-Arab children to make up 78 percent of all pupils in Israel’s schools by mid-century—making Israeli Jews, protectors of the Zionist dream, a small minority. This creates three serious problems for Israel’s future as a secular democracy. Second, while the number of illegal settlers in the occupied West Bank has grown from 12,000 Jews in 1980 to more than 300,000 today, religious Jews have led the charge, accounting for 80 percent of the settler population—with Haredim comprising an ever-increasing percentage. To them, this is not occupied territory, stolen by Israel from Palestinians in the 1967 war—as much of the international community, including the United States, believes. This land is at the very core of Israel’s biblical identity—the land where Jewish patriarchs Abraham, Isaac and Jacob lived, where Joshua declared the Jewish nation after 400 years of slavery. With the West Bank at the heart of any future Palestinian state, Israel continues to face the difficult choice of enticing settlers to leave, forcing them to leave, or simply abandoning those who refuse to leave to life under Palestinian rule. It’s difficult to imagine Haredi Jews leaving under any circumstance. Third, to most Israeli Jews, the real problem, as an American rabbi puts it, is that “the future they would create looks more like Islamist Iran than any Jewish culture that you would want to be part of.” The list of what’s been called “aggressive medievalism” perpetrated by Haredi Jews is long and quickly growing. In December, Haredi men spit on an eight year-old girl whom they judged to be immodestly dressed while walking to school. In Jerusalem, outraged women have been forced by some Haredim to sit in the back of the bus. Meanwhile, the chief rabbi of the air force stepped down because the army refused to excuse Haredi soldiers from attending events where female singers perform. Many worry about what this extremist minority is doing to the state, and ask: what happens when ultra-religious Jews are the state? Meanwhile, resentment among other Jews—who withstand the insults, pay the welfare stipends and serve in the military—continues to deepen. In 2006, a third of Israelis identified Haredi Jews as the state’s most hated group. Where will this go? A strong signal will be sent this summer. In February, Israel’s Supreme Court ruled that the decades-old draft exemption, known as the Tal Law, was illegal. A wide majority of Israeli Jews believe Haredim should serve in the military. By July 31st, the governing coalition led by Prime Minister Benjamin Netanyahu must come up with a new solution. A commission is expected to draft a compromise. The Haredim are already threatening to choose prison over military service. The world has grown accustomed to Jews fighting Arabs—but what to do when the greatest threat to Israel’s future is Jews fighting Jews? If the Zionist dream is going to survive, Modern-Orthodox, Conservative and Reform Jews must be heard. They will never have more leverage than they do right now. By the end of July we’ll know if Herzl’s dream still has a fighting chance. This entry was posted in Articles, Israel, Op-Eds and tagged David Ben-Gurion, Egypt, Haredim, Israel, Jerusalem, Jewish, Jorda, Judea, Mossad, Samaria, Six-Day War, Syria, Theodor Herzl, West Bank, Zionism by Stanley A. Weiss. Bookmark the permalink.